In the world of marketing, your online presence becomes more important than any other marketing tactics such as billboards or TV commercials. With the dawn of digital marketing, you can connect strategies for social media, search engine ads and email marketing, all to your website, integrating them together for the ultimate charge to bring in more customers. Whether you run a small marketing agency or a large corporation, it all starts with the website. However, the beginning of your business is not always the easiest in terms of cash flow. Where does your money come from? Is it required to hire someone who is well versed in building websites? In today’s day and age, you really don’t have to spend thousands of dollars on a web developer, because WordPress themes allow for you to build a website yourself. Even if you don’t want to spend the time modifying your own theme, it’s going to be less expensive to get a theme and have one of your employees, or a freelancer, customize it for you. The themes on this list have all the tools needed to advertise your marketing services in style. Look for flexible customization options that allow you to brand your site with ease, along with page builders that require no coding knowledge. Sliders and calls to action are also available to provide a description of your services and send people to your sales pages while portfolio presents your past work in style. 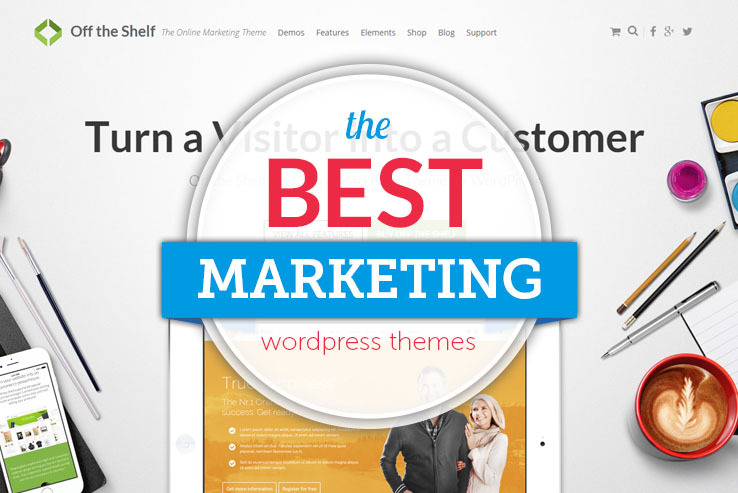 The internet is filled with Marketing WordPress themes, so we narrowed it down to a list of the best ones. Keep reading to find a solution for you. The Marketing Agency theme comes from the folks at Template Monster and it has a responsive, full-screen layout with a beautiful header background for showing what your company does. Overlaying text and buttons are available, but the best part is that the theme is fully editable from the backend of your website. Custom post types and formats allow for gallery, image, and quote posts, while the multilingual settings allow you to offer your marketing services to people from all over the world. Over 80 shortcodes allow you to implement buttons and columns, keeping your hands completely free of any source code. The Marketing Agency theme provides a two-step installation process and the filterable portfolio has what you need to share you past work with new clients. The multiple color options make it easy to incorporate your own branding, while the custom widgets are handy for social media buttons, comments, and more. Customize your typography with over 600 Google Fonts, and use the advanced backup tool so that you can easily restore any of your files or content if something goes wrong. Check out the Metro Pro WordPress theme if you’d like a theme that works with the Genesis Framework. 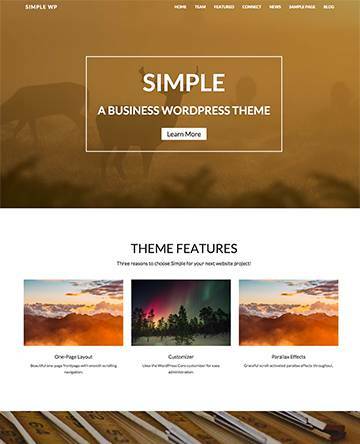 As with most StudioPress themes, the Metro Pro theme is built on the Genesis Framework, so it’s one of the easiest to customize WordPress themes you can find. As a marketing tool, your website will look clean and beautiful, with a modern, magazine style layout for showcasing your best articles, along with some cool portfolio items. This is a spacious, wide frame theme, and it includes various social features for sharing your articles and sending people to your most popular social platforms. Five color styles make it easy to find a style that fits with your brand, while the custom header allows you to upload your own logo. Six layout options are nice and the featured images give a hint of what people can expect before clicking through to an article. The landing page template improves the chances of people buying something from you, while the custom menus make it easy for readers to navigate through your website. Finally, the entire Metro Pro theme is completely responsive, so people can view your content on mobile devices such as phones and tablets. 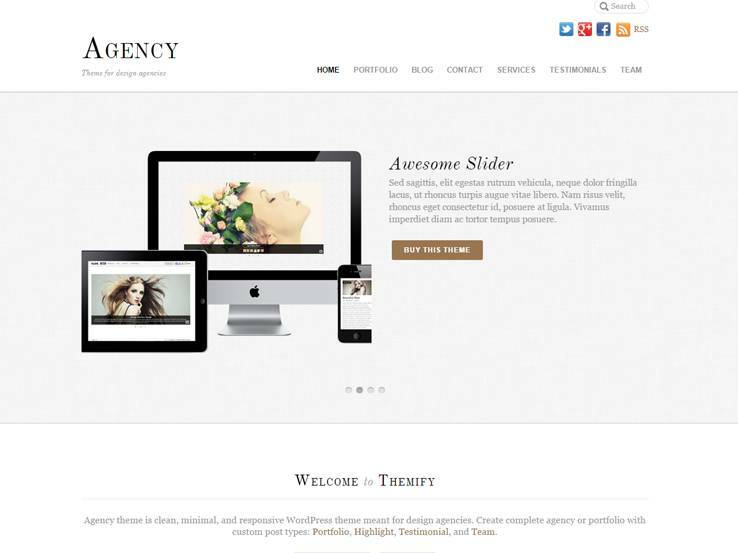 Agency comes from the folks at Themify, which is a good thing, considering the Themify framework is one of the best options out there. The theme includes an awesome slider for showing off your best content and sending people to sales pages with overlaying text and buttons. The social media buttons are designed to send folks to places like Twitter and Facebook. You can create testimonials and services pages, each of which shows why people should pay for your marketing services. The responsive layout looks good on just about any device and the custom post types enable you to create anything from portfolios to galleries. Lightbox media support makes photos cleaner and easier to view while the custom header menu makes navigation clear and easily accessible. Seven theme skins have what you need to get started quickly on your design and the four footer widget columns are useful for implementing various widgets, some of which can highlight old posts, while others can work well for social media buttons and sharing tools. 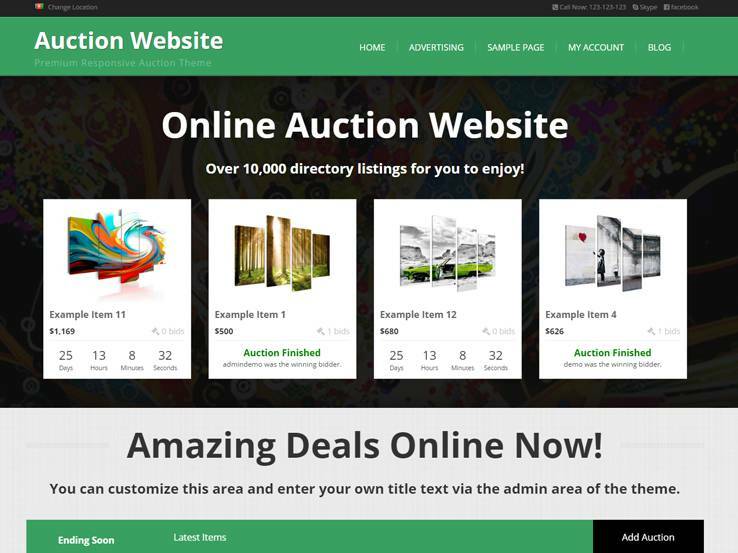 The Auction WordPress theme is a solid choice because you can market a wide selection of products to people or other companies. This theme generates a site similar to eBay, but you can customize it to make it serve a distinct market. With over 100 admin options you’ll never run out of ways to distinguish yourself from the crowd. The responsive layout looks great on any device and the account area allows people to see exactly which bids they’ve made in the past. No plugin is required. You can create Buy Now buttons and the auto bidding system has what you need to improve the amount of money you bring in for your company. Choose from over 20 payment gateways, and customize the member’s area so people have an easy time using your website and want to come back to bid on more items. The best part is that you can set how much commission you make on every auction, putting you in control of the money you make. 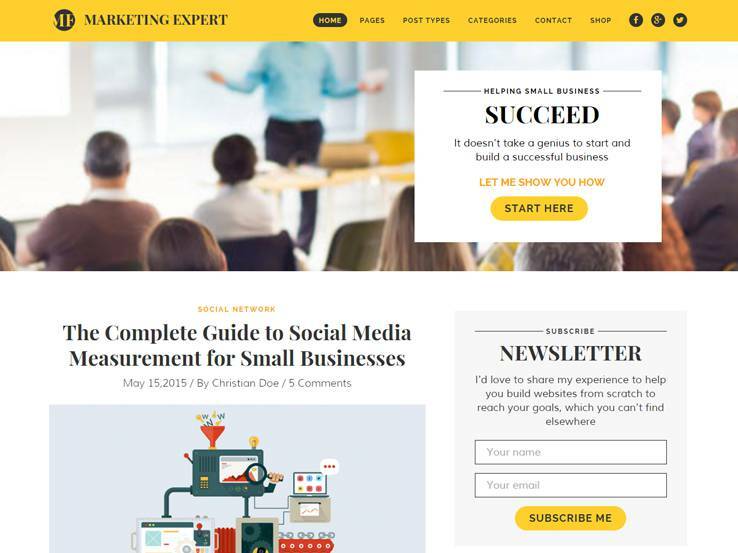 The Expert WordPress theme is the quintessential theme for marketers of all types. It’s a creative blog theme with various tools to place customers in a marketing funnel and convince them to buy something eventually. The thin header area has several social icons for building your social platforms. The responsive nature of the theme means that anyone who comes to the site on mobile devices shouldn’t have any problem seeing the content. The homepage provides a promotion box and image, which comes in handy if you’d like to collect email addresses or share information about a promotion or coupon. The bold blog headings are required to convince people to keep reading and the top subscription widget allows you to collect more email addresses from your customers. Also, another promotion box is included with a sleek button that people can click on and go to a landing page. You can easily send someone to a product page or landing page where you can try to sell them additional products or features. Finally, the bottom call to action sits at the very bottom of your website and it serves as a last chance reminder for those who still haven’t decided whether or not they are interested in enrolling or buying something. 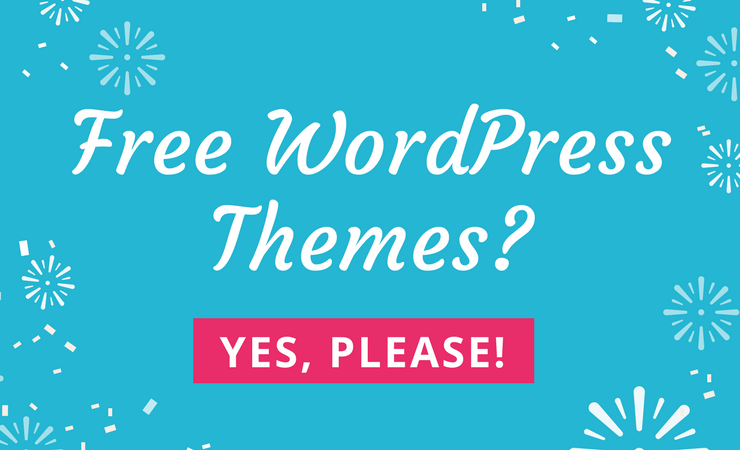 Along with WooCommerce integration, Google Fonts, and unlimited color options, you can’t go wrong with the Expert WordPress theme. 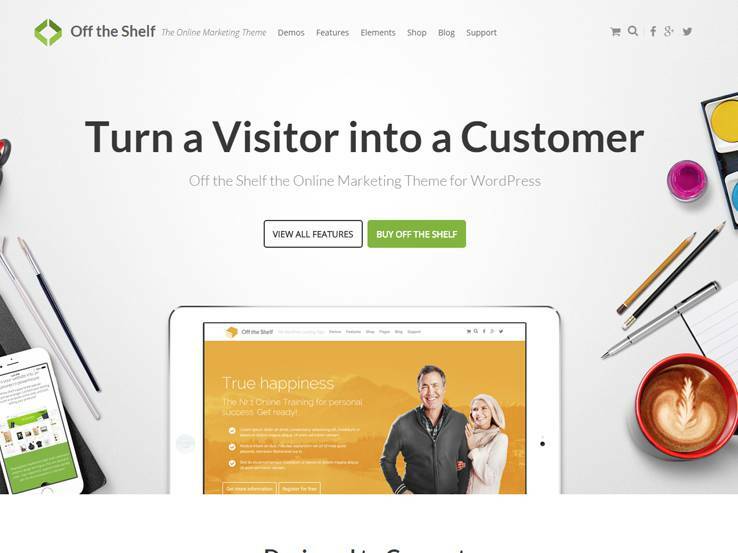 Off The Shelf is a beautiful marketing theme with a drag-and-drop page builder. This comes in handy for both beginners and advanced users, since you can quickly design your websites and not have to worry about getting your hands messy with code. The responsiveness of the theme means that anyone can view the website, regardless of the device being used. Make an unlimited amount of websites with this theme and choose from unlimited colors and layouts. Along with being easy to install, Off The Shelf has SEO built-in, pushing your search engine rank higher and higher. The Off The Shelf theme integrates with WooCommerce, meaning that you can start selling digital or physical products. The Off The Shelf theme is completely customizable. The theme includes over 700 fonts, each of which makes it easy to add a touch of style to your content. Over 580 icons are also included, for adding some visual elements to your sites and making it easier for people to read and follow along. Along with video support and animations, the Off The Shelf WordPress theme is one of the nicest we’ve seen. 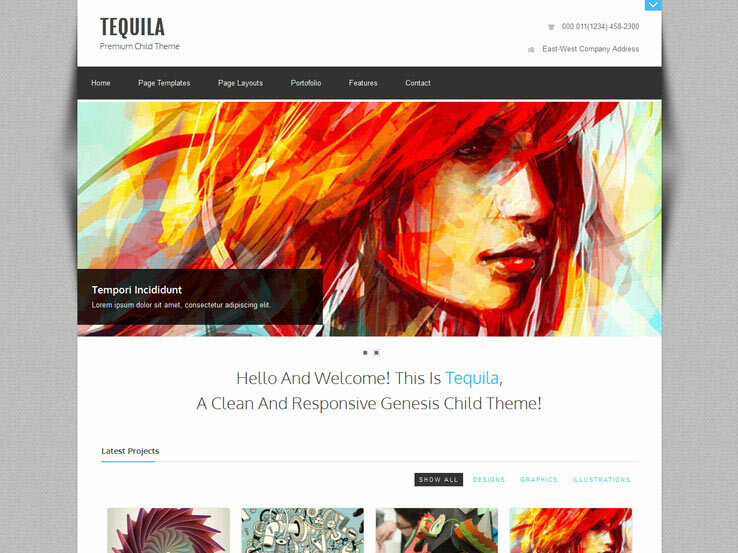 The Tequila theme may sound like a theme geared for a bar or club, but it’s actually quite professional and perfect for a marketing firm or online marketing individual. 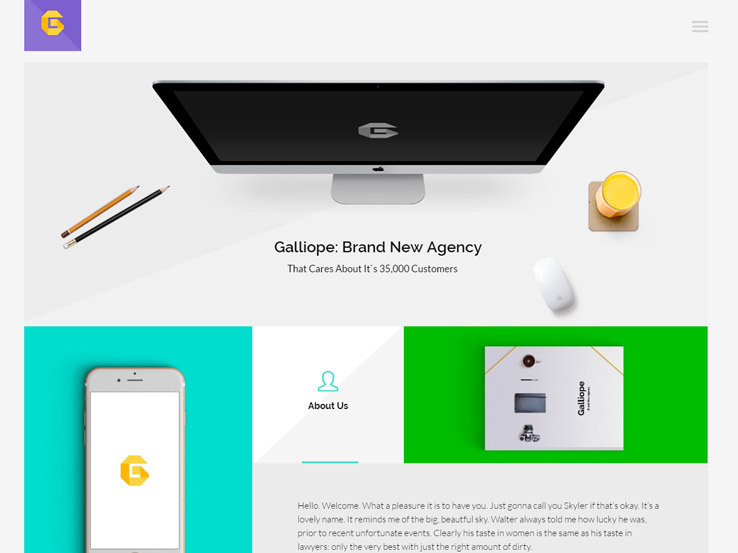 This is a portfolio theme for showing off your past work and it includes a responsive design that looks great even on mobile devices like tablets and phones. 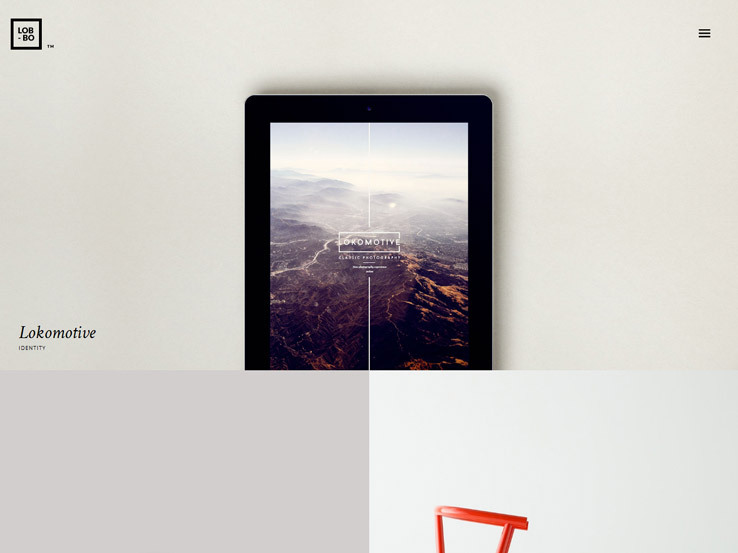 If you’ve never seen a ZigZagPress theme, you’ll quickly notice that they are very minimalistic. This theme has various predefined color schemes and you can upload your logo from the backend. Highlight your contact information in the header area and use the integrated slider to display new products or services. There’s even an overlaying text feature for talking about your company. The portfolio is included on the homepage and it includes filtering options. This makes it much easier for potential clients to see your most relevant work. You can highlight your team members on the same page, using their social links, photos, and descriptions. 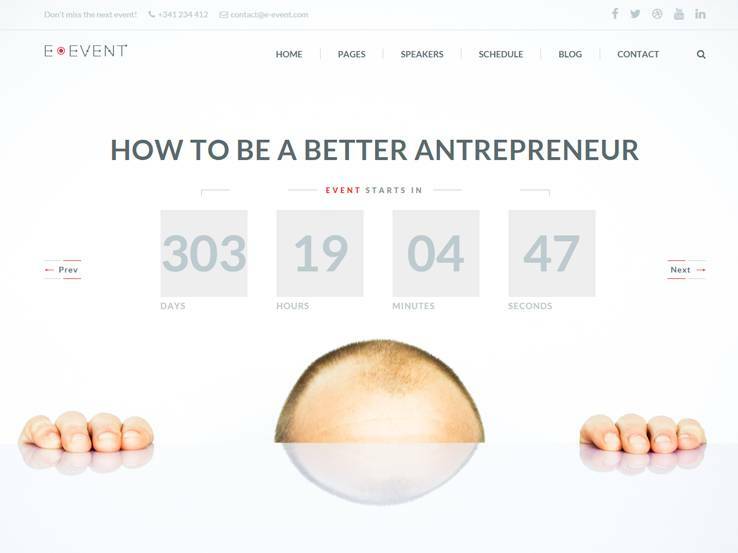 The E-Event WordPress theme is especially useful for marketing agencies that need to organize events. Since so many companies are having live and online events nowadays, it’s essential to build buzz beforehand. This theme gives you the tools required, including a countdown timer and a full website for talking about the details of said event. This is different from many other countdown themes out there because they are generally a one-page layout with limited functionality in terms of building a full website. The E-Event theme is completely responsive and looks great even on tablets and phones. An upcoming events carousel shows more than one event by highlighting images that are more likely to get people to click through. Filterable events are nice when you have multiple categories and several pricing layouts improve the transparency of how much the event is going to cost. Two schedule layouts are included and the translation files allow you to market your event worldwide. This is particularly useful for an online event. The theme comes with the Tickera plugin, which has the functionality to deliver a shopping cart, discount codes, ticket fees, custom forms, and more. It basically turns your entire website into a ticket distribution system, perfect for marketing events and managing attendees. 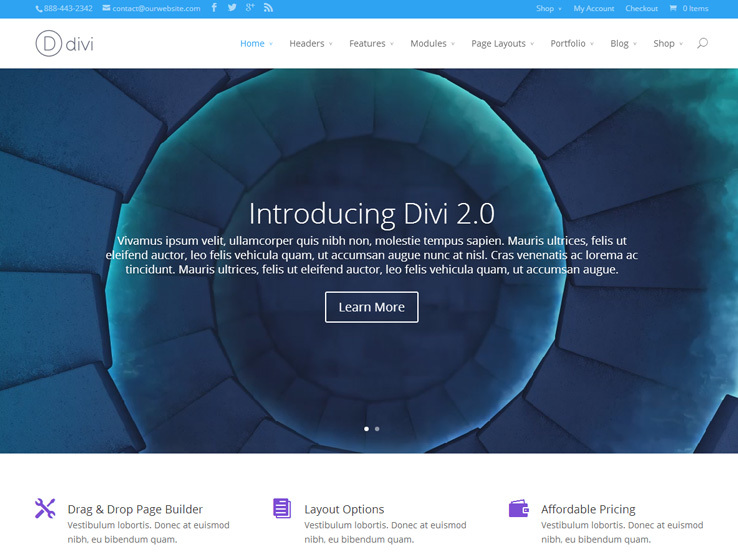 Divi is a flagship theme from Elegant Themes and it has all the right features to create the ultimate website for a marketing agency. The theme ships with the Divi Builder which allows you to create gorgeous layouts which include modules for services, testimonials, calls to action, contact forms, sliders, portfolios, and much more. Use the sliders to create a brief description of your marketing agency, feature your services, and create beautiful portfolios to feature past clients and build social proof. The Divi theme is also responsive so people can view your services even if they are on the go. You can easily incorporate your own brand identity by customizing colors, fonts, uploading your own logo and favicon, and much more. Use the blog page to share valuable content with your audience and help them learn more about the latest marketing trends while at the same time boosting your search engine rankings. Divi is truly a powerhouse of a theme that you shouldn’t ignore. 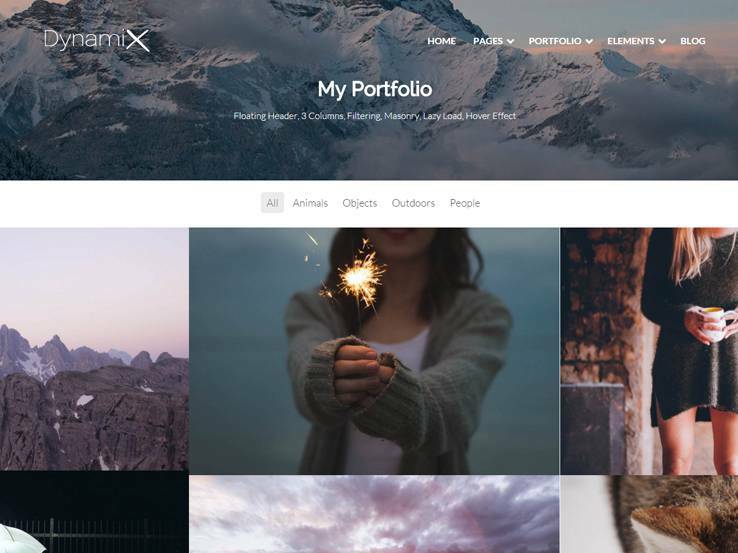 Dynamix theme includes parallax backgrounds, animated images and elements, and plenty of features that allow you to create a website that stands out from the crowd. The theme includes several page layouts which are essential for marketing your business and attracting new clients. Use the Services page to show all the different marketing or ad services you provide and take advantage of the portfolio page to showcase the clients you’ve helped before with their marketing strategy. The contact us page is essential so potential clients can easily inquire about your company. The theme also includes various shortcodes such as testimonials, accordions, infoboxes, all of which allow you to add them anywhere on your website without touching a single line of code. Use the button shortcode to create a call to action that sends people to your sales pages or straight to your contact page. Infoboxes and pricing tables are the best way to highlight the features of your packages along with pricing information. Along with responsive design, Visual Composer plugin, and an advanced set of customizations, DynamiX is definitely worth checking out. 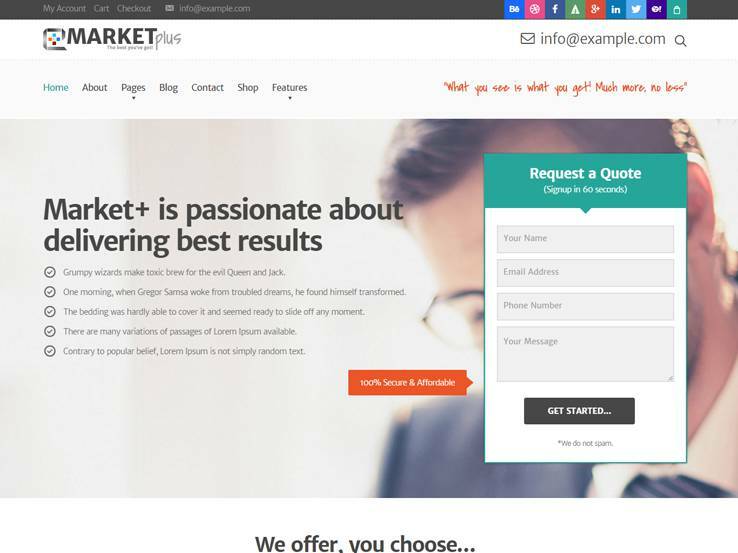 MarketPlus is a responsive, modern theme that is sure to appeal to many marketing and ad agencies because it has an impressive set of features and easy customization options. The theme features a prominent “request a quote” box right in the header area which serves as a great call to action for anyone interested in marketing services. The homepage allows you to feature various packages and services you offer along with your most trusted and best-performing marketing agents. You can also include testimonials and logos from past clients to build social proof and use the blog page to share marketing tips and news with your target audience. The theme includes Visual Composer plugin which allows you to build complex layouts without having any code knowledge which is perfect for marketing agencies who need to launch their website as quickly and efficiently as possible. Easily integrate your brand with the advanced theme options panel by setting your corporate colors, fonts, and uploading your logo. For the best results, consider including a portfolio of your past projects or integrate WooCommerce to sell physical or digital products such as books covering best marketing practices. Agency themes from developers from all over the world are meant to wow clients and the Lobo theme is no different. They call it a portfolio and WooCommerce theme for creatives and it certainly lives up to the promise. The theme gives all webmasters the tools for integrating with WooCommerce, a powerful eCommerce plugin without any problems with scaling up. All you need to do is add your products, connect your payment processor, and start selling. In addition to that, the theme has a completely responsive design, meaning that all buyers and portfolio viewers can view your website on mobile devices without any issues. Lobo presents the near perfect portfolio for freelancers and other creatives, seeing as how the imagery takes up all of the screen space. These portfolio items look more like featured images and they are placed close together to achieve a more modern look. The unique module building tool on the backend of Lobo allows you to construct your own custom modules without any need for coding. You also gain access to an unlimited number of layouts. Blogging and writing your own posts for the world to see is an essential part of having an agency website. Share biographical information about your models or talk about how your design agency has come to fruition. It doesn’t matter what you’re looking to achieve, the blog is there and it looks so darn pretty. The Royal Slider plugin is included with your purchase, which is a steal considering it usually sells for around $24. This means that you have access to a sleek and fast slider that supports high-resolution images. You can implement overlaying text and buttons to use as calls to action, since the whole point of having a slider is to get people to click on it and view more information on a separate page. You may link the slider to another landing page about some of your best models. 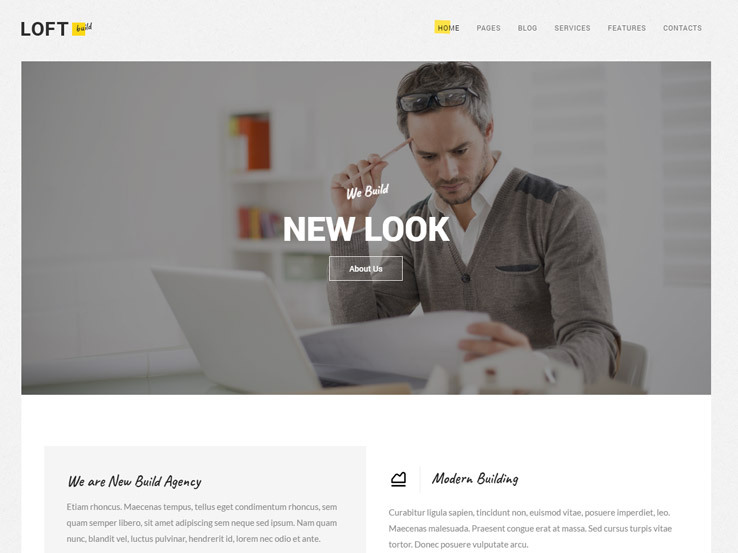 Overall, the Lobo theme is one of the best solutions for agencies, regardless of the type of agency. The customizer on the backend is smooth and simple, while the Google Fonts and dummy content both provide ways to get started with your entire design. 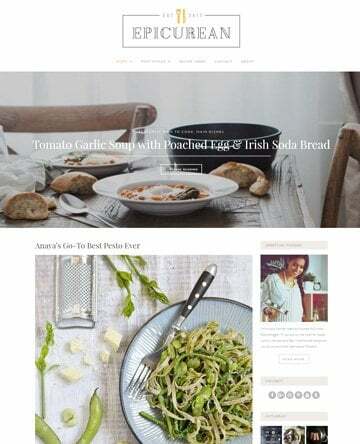 The Pur WordPress theme delivers a creative design, with a clean and modern background for presenting your imagery and content in a reasonable fashion. We like this one best for creative agencies, the ones that sell designs, art, models, and mainly image-based content. The theme is completely responsive, allowing for people to look at your blog and pages without having to scroll or get frustrated with the amount of clicking they have to do. The theme comes with a plethora of features such as the logo upload and preview. We also enjoy the Google Analytics integration, which allows you to see how many visitors have been on your website, where they came from, and which posts they clicked on the most. You can upload your own favicon and over 600 Google web fonts make it easy to add style to your typography. We like the theme because all of these tools are easy to use and suitable for both beginners and advanced users. The one-click demo content provides a nice start to your design process and it makes a perfect setup for displaying your work. This is a fully customizable theme, with options for unlimited portfolio entries and unlimited galleries. The customizable slideshows are a nice touch, and many blog options help out when you’re trying to boost the effectiveness of your SEO strategy. What’s intriguing is that the six extra gallery types expand on the number of portfolios you can have on your agency website and the testimonials are bound to show clients that your company is worth working with. Since these testimonials are already formatted, all you have to do is copy and paste the quotes from people who have vouched for you. Play around with the settings to achieve your own custom image sizes and use these tools to cut down on the amount of time spent with software like Photoshop. 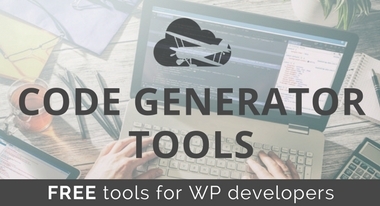 An easy translation tool is included with the Pur WordPress theme, opening up options for you to communicate with people and organizations all over the world. After all, an agency is going to work with a foreign company at some point, so you might as well give everyone an opportunity to understand what you’re saying. 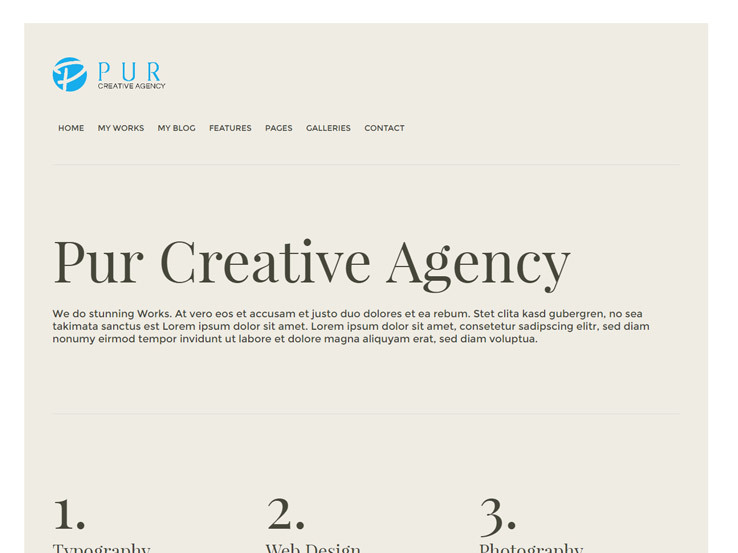 Along with unlimited sidebars, over 100 shortcodes, and parallax sections, the Pur WordPress theme is a piece of art. Consider the Charm WordPress theme if you’re looking for a lightweight and clean portfolio for presenting your imagery in a clear fashion. 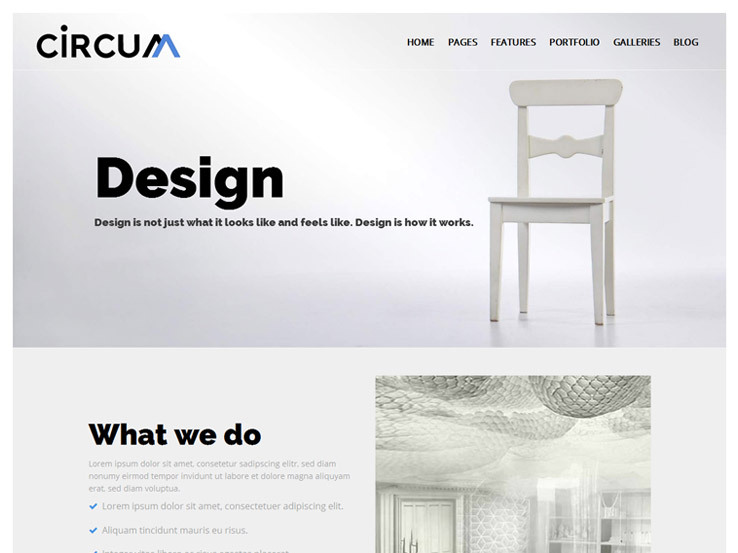 The theme has plenty of white space, which places focus on the content that matters. This theme is powerful and lightweight and it has a completely responsive layout for viewing on smaller devices. Choose from isotope and masonry layouts and use the infinite scroll to keep users on your page for longer periods of time. Multiple portfolio pages are essential for large agencies, while the theme customizer support includes everything from six different page templates to three different blog layouts. 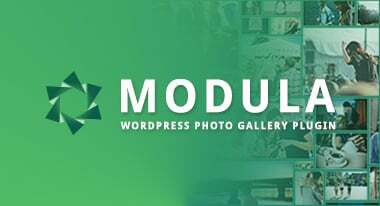 Grid, full width, custom social, and recent project widgets and layouts come with the Charm WordPress theme, while the image, video, and gallery support are sure to grab attention when potential clients browse through your website. FontAwesome icons add more visual appeal to your website and the localization is bound to ensure that you have the support for connecting with anyone who comes to your site. The header is an impressive part of the theme since it uses a large image background and a module in the foreground to present text. This is a great spot for a call to action and it can support the logo and navigation bar that resides right above the header. The portfolio sits below the header and a filtering bar is capable of only showing the items that clients are interested in. For example, if a modeling photographer is only interested in children for a commercial photo shoot, they can cut out all of the other models you have listed on the site. The rest of the theme is about as basic as they come, with few layouts, and not many extras in terms of social media buttons or anything like that. However, you will find that the blog is a simple and creative one, with a few layouts for keeping attention when people scroll around your blog. Not only that but you gain access to several gallery features and tools, which is essential for any type of creative agency. 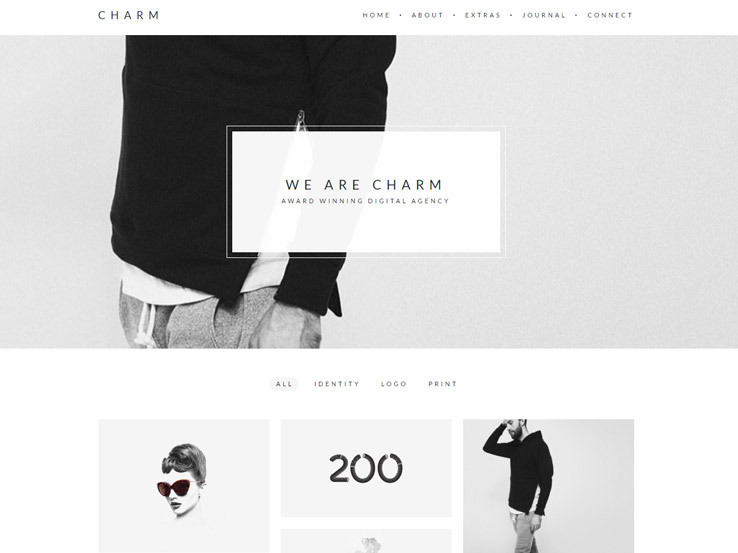 Therefore, we recommend the Charm WordPress theme for anyone looking for stunning galleries and clean layout. Clean, sharp lines are always in fashion and that’s just what you’ll get with the Galliope theme. Each of the four homepage options gives you a modern look with a sleek layout and bright colors. There are tons of great options for filling in the content blocks to emphasize the most important parts of your business. Intersperse links to informational content like About Me and Services with sample photos from your portfolio for an exciting visual experience. Or maintain stricter separations to demonstrate a no nonsense approach to your work. You’re a creative professional so you’ll appreciate the ability to design a unique website with Visual Composer and the Theme Customizer to match your brand’s colors. Your eye for presentation will be gratified with the gorgeous Revolution Slider for displaying your work with style and the ability to build child themes will ensure that your site is never dull or predictable. Build a website as classy as an Audrey Hepburn movie with Didi. 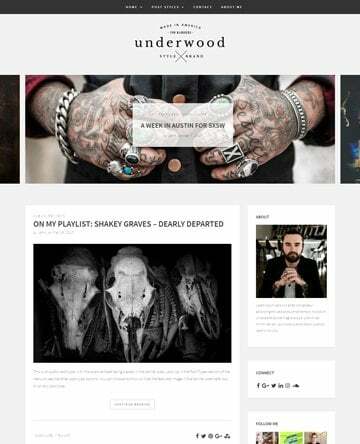 This theme is ideal for black and white photographs of your designs or your favorite outfits. The demo site has a vintage feel with a typewriter-like font and a black on white color scheme. Color and typography options allow you to accent your photos and put even more of your personality into the site. Your users will easily be able to keep up with the latest trends with a sidebar for your Twitter and Instagram feeds and the ability to subscribe to your blog for emails when you write a new post. 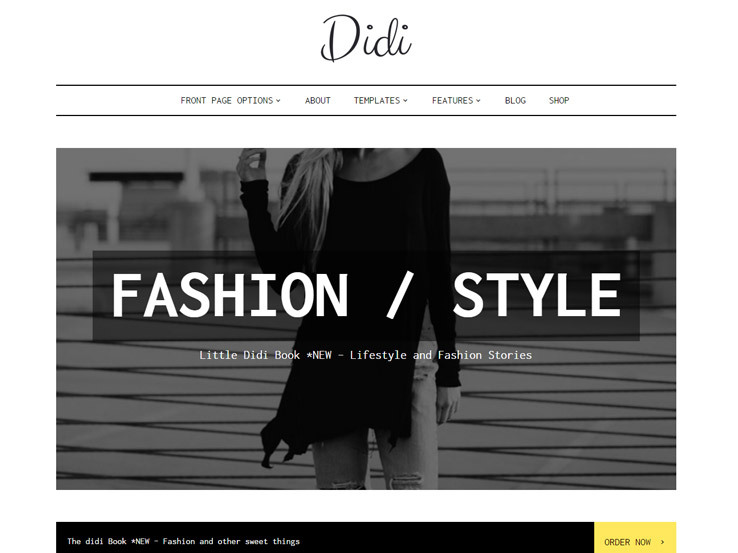 Didi is a fantastic choice for fashion houses, big or small, with WooCommerce integration for online sales and the option for shoppers to sort their search by price, rating, or popularity. It comes with several page templates to make design easy but also features a page builder to make your site stand out as much as your creations. And while the language of fashion may be universal, your website will be much more accessible with this translation ready theme. Loft has a style and feel that’s ideal for designers of ultra-modern architecture, furniture, and décor. A chic, no frills layout will go perfectly with the sleek silhouettes of your work. The blog page is multifunctional with a sidebar for searching, categories, and a calendar. Customers and fans can keep up with your sales, expos, and exhibits with no problem. The services page can also be sorted by category for an elegant user experience to match your overall brand. Another cute feature is a little block of color, like a Post-It note, on the menu bar to indicate what page you’re on. Getting started couldn’t be easier with the one click demo installation and Visual Composer to make the site your own. Loft comes with a live editor that allows you to make color adjustments, add graphics with the Font Icons Loader, and tweak the Revolution slider without constantly updating. 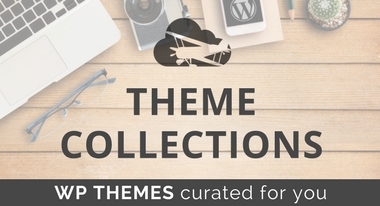 Well documented and backed by great customer support, this theme will make your life easier and more stylish. 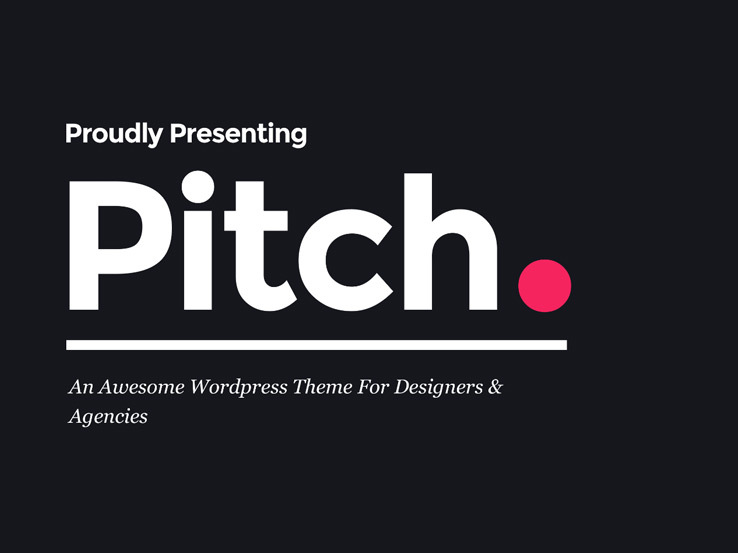 With 12 distinct homepage designs, you’re guaranteed to find a style with Pitch that will fit your business type and focus. If you want to put your designs in the limelight, choose from one of three portfolio homepages or put your shop up front to emphasize the merchandise you offer. For large organizations, the Agency or Corporate layouts might be a better fit with content areas for Team Members, Services, and the option for links to separate pages for different office locations. Whatever you choose, your website will look amazing. This theme will really appeal to your creative instincts with its array of animation options. Fonts, borders, hover effects, and sliders can all have exciting animations added to spice things up. You can also give visitors a glimpse of how your creative process works with four case study templates. Walk them through each project from beginning to end for insight into what working with you will be like and a major wow factor. Art knows no limits and unlimited is truly the byword with the Planco theme. Unlimited colors and fonts. Unlimited sections and slideshows. Unlimited background images to make every page unique, keeping your site interesting and showing off your work. No need to worry that the possibilities will be curbed by your design skills, either. Demo content is ready to load as soon as your make your purchase with simple customization to follow. You can also create new pages with Quickgalleries and manage everything with the Ajax powered admin panel. You may be an artist, but you’re also running a business. Planco is perfect for helping you bridge the gap. Install Google Analytics and Webmaster Tools to assess website performance and use the data to make yourself even more effective. With scientifically derived information and SEO optimization, your site will be easy to find, beautiful, and functional. Then take the extra step toward success with a WooCommerce based shop, included with this theme. 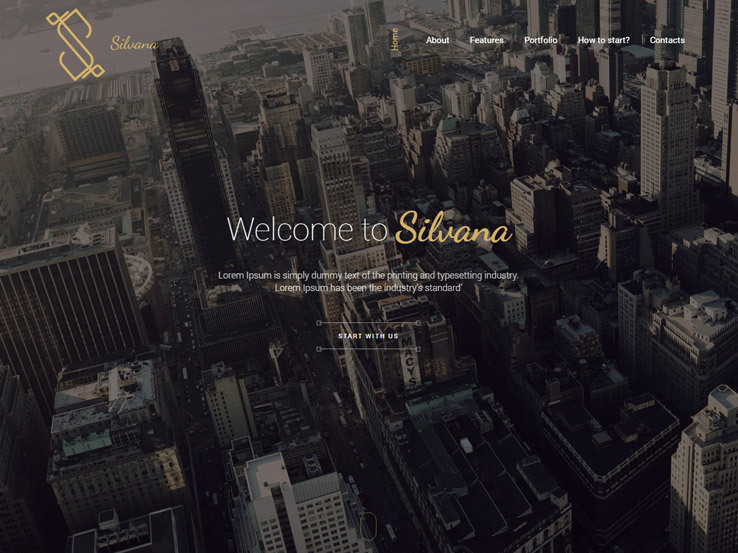 Silvana is an excellent choice if you’re looking for simplicity with style. 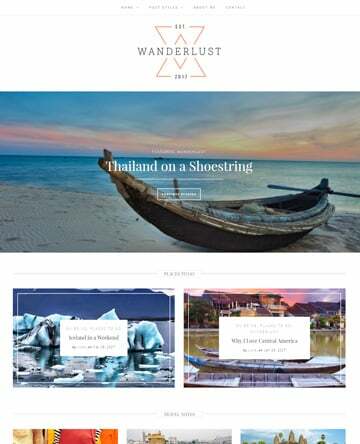 This theme puts all of your content on one page with a sticky menu to take users to the right area. Grab their attention from the start with one of three attractive header options. Make a bold statement with a single representative image, showcase some of your best work with a slideshow, or exhibit your creativity with an introductory video. The portfolio section of the page is particularly handsome with its sortable grid setup. Click on an image and it will open in an overlaying slideshow screen that has an elegant look and doesn’t make you leave the main page. 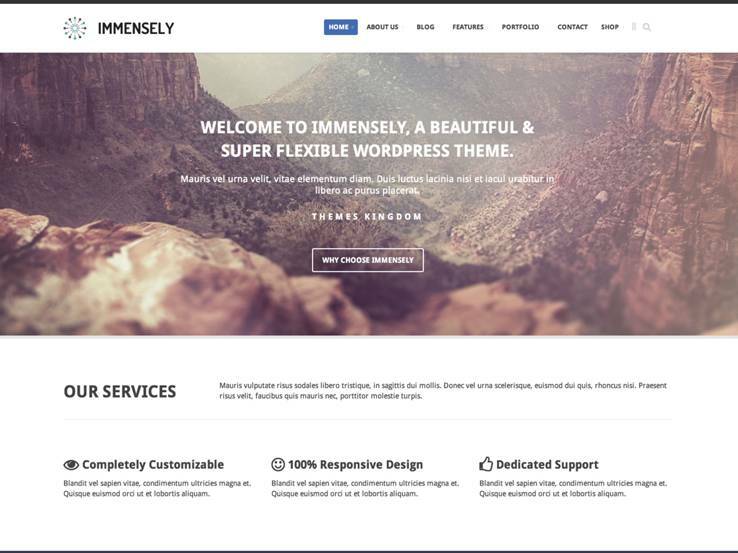 The simplicity of this theme does not mean that you can’t use your imagination when building your site. Unlimited Google fonts and Font Awesome icons will individualize the page while the custom widgets and unlimited sidebars allow you to make it exactly what you need. The more than the 100 shortcodes and customizable code is great for tailoring the site to your vision once you’ve installed the easy to use one click demo. Circum is a fantastic choice for showing off your work with class and elegance. There are six portfolio options and seven gallery possibilities, all of them a graceful arrangement to please the eye. The Masonry gallery, in particular, captures the offbeat feel of truly creative design. The blog, with its numerous post-types, is perfect for giving more insight into your inspiration and process. A video of developing a project from start to finish would be especially entertaining and draw customers in. A quote post is a great way to pay homage to your heroes; you can use link posts to help visitors learn more about them too. Altogether, Circum comes with more than 500 theme options from color choices and webfonts to widgets and backgrounds. The theme options panel and slideshow management tool with its drag and drop interface make administering your fully responsive site simple. You can also install Google Analytics and Webmaster tools to optimize site performance, use the translation feature to make your business accessible to a wider audience, and streamline sales with the WooCommerce plugin. Great design always keeps the viewer on their toes, giving them the unexpected. The Oscend theme will fit your design aesthetic with its asymmetrical content blocks to give your site a unique and stylish look. 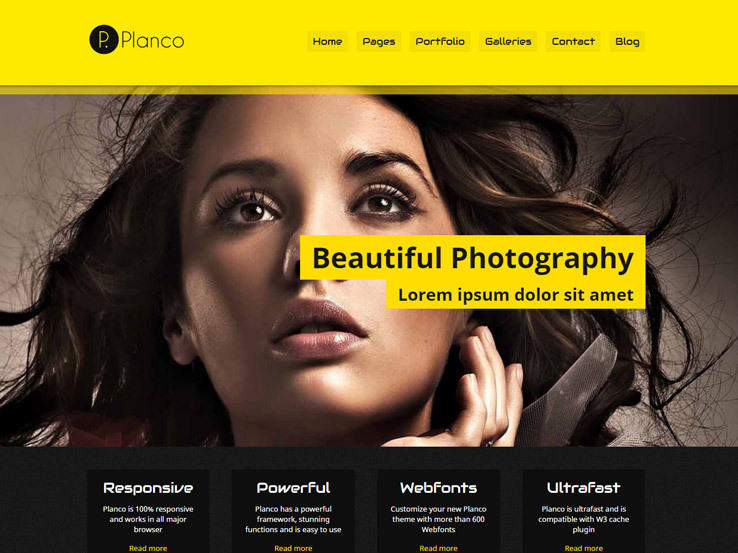 This theme is also a spectacular choice for selling your expertise to potential clients. Project pages, linked from your portfolio, list the skills used to complete the job as well as the option to show off your process. A shop that can be filtered by price, rating, or product category will allow visitors to take the next step in working with you. This theme is a wonderful choice for a company with a strong social media presence. Subtle social media icons in the footer will alert visitors to all the ways they can interact with your company in this modern business landscape. Bolder buttons on the Contacts 2 template give a more forceful reminder. Individual team members can also link to their own social media pages and visitors can share blog posts and portfolio items with easy share buttons. The Immensely theme comes from the ThemesKingdom company, which is known for solid support and well-coded products. The theme has an immense amount of potential for marketing your products or services, considering it provides a clean and responsive layout, using visual elements to generate buzz and increase interactions. The Page Builder is one of the best in the business with lots of drag-and-drop elements so you don’t have to touch any code yourself. You can drag a tab, button or widget directly onto the homepage and see the result after previewing what you created. Setting up a shop is easy with the Woocommerce plugin. You must download the plugin in order to make this work, but the Immensely theme is designed to format your products without any problems. A shopping cart is included and you can even feature a few of your most popular products in the sidebar. The Immensely theme comes with the Revolution Slider plugin, which is considered one of the top slider plugins on the market. Feel free to customize your animations and use the slider to upload high-resolution images to capture the attention of potential clients. Several page templates are available to choose from, cutting down on the amount of time you’ll have to spend designing from scratch. 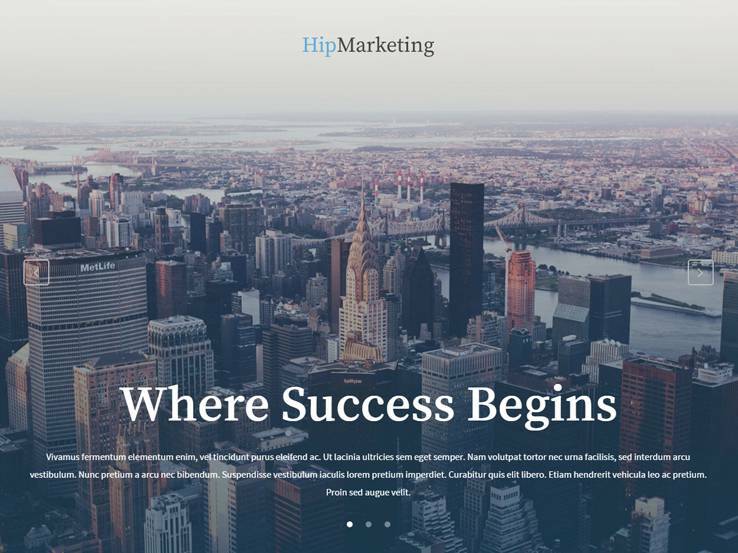 Along with contact forms, Google Maps, custom widgets, and a shortcode generator, the Immensely WordPress theme is a rather impressive package, giving you a way to present your marketing materials in a professional way. You have done excellent work really appreciated… I’m thoroughly enjoying your blog. I won’t think twice to endorse your blog post to anybody who wants and needs support about this area. I would be very grateful if you could add Veriyas Pro which helps in marketing, corporate or professional business websites to showcase your business or portfolio.